Iron On Transfer Masking Sheets are sold separately. Our Iron On/Heat Transfer Vinyl Sheets are ideal for your decorating and personalization needs. Use your creativity and imagination to design and cut some beautiful personalized gifts for your friends and family. 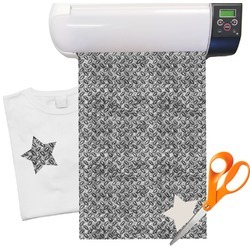 Want to see examples of how to use these iron on / heat transfer vinyl sheets? You can cut out your name, a monogram, or any designs with a pair of scissors or with any hobby cutter such as the Silhoutte, Stika, Cricut etc.You can create thousands of decorations that can be ironed on to anything that is cotton, polyester, or a cotton/poly blend!! Our iron on vinyl is a little bit different from other vinyls out there. First ours are printed on demand - that mean we print just for you and therefore we can offer them to you in multiple colors and multiple patterns. Also, our vinyl is not pre masked, so you have to cut it, weed it and then mask it with a heat transfer mask before you iron it on to your garment. Our youtube videos show you how to use the iron on vinyl sheets, as well all the vinyl sheet types that are available. I loved this. I used it with my silhouette and heat press. It worked beautifully. I would have given it a 5 but it's a bit pricey for 1 sheet with shipping.